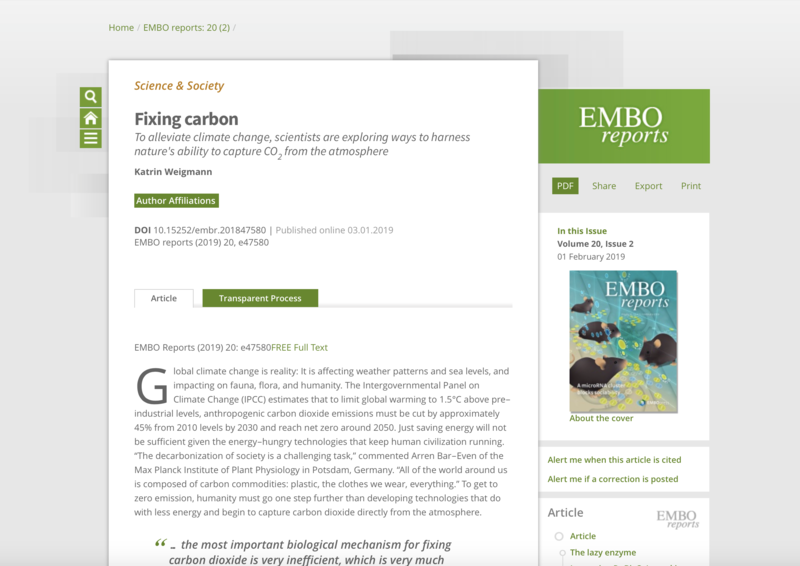 At the beginning of this year, German scientist and science journalist Katrin Weigmann published an article called „Fixing Carbon“ in EMBO Reports. The article gives an overview about ongoing projects in genetic engineering which are exploring ways of "harnessing nature’s ability to capture CO2 from the atmosphere". Carbon fixation solutions are an urgent issue in mitigating or stopping global climate change. Dr. Arren Bar-Even, our project coordinator in eForFuel, contributed to the article by sharing his insights and knowledge about the topic from various projects he is involved in. He emphasizes the importance of decarbonization of society and states that carbon commodities are all around us from plastic to the clothes we wear. As he explains, “Abiotic processes are very good at dealing with gases like carbon dioxide and very efficiently can activate carbon dioxide into reduced compounds.” He points out the importance of hybrid systems of biological and chemical approaches. eForFuel, of course, uses electricity and microorganisms to convert CO2 into hydrocarbon fuels, thus providing a sustainable replacement of fossil carbons. You can read the full article here and learn more from scientists working in the field about how engineered organisms can fix carbon.